Warren Ellis doesn’t need me to sit here behind my keyboard and say he’s great. That’s a universal fact as well established as the tides themselves. 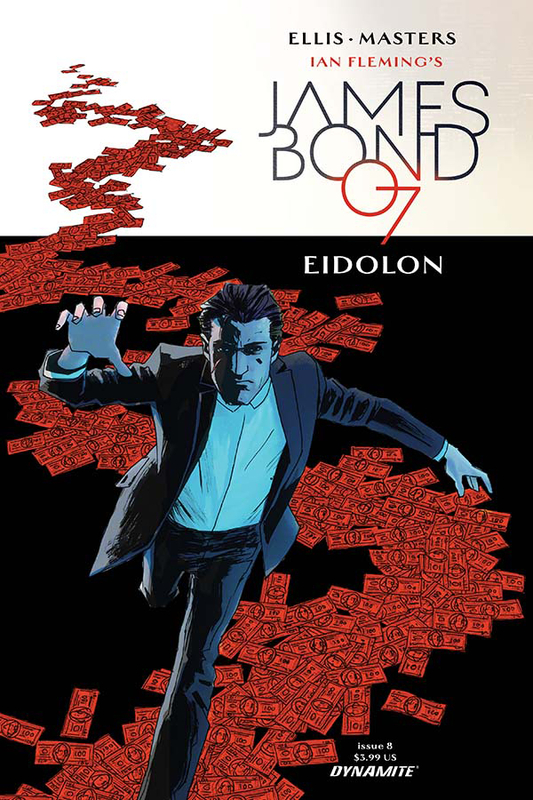 His greatness continues in the second issue of James Bond’s second arc, “Eidolon.” Like “Vargr” before it, Eidolon is a tour de force in what a world-class writer can do with a character that he understands on an almost cellular level. As I’ve said before, the Bond of Ellis and Masters is Sterling Archer with a brutalist edge. He’s Daniel Craig with trapped in a fatal circle of loyalty, women, alcohol, and obsession. He’s Fleming’s Bond served straight up and occasionally, he’s a masterpiece. Perhaps key to all of that is how little time Ellis wastes. Eidolon doesn’t seem like the slow burner that Vargr was. Instead, it’s a wrecking ball that puts Bond in an absolutely brutal close quarters brawl almost as soon as possible. It’s in that fight scene that Ellis and Masters are perhaps at their peak. For 34 panels no words are exchanged. No grunts, not exclamations, no cries. Nothing but the meaty brutality of several men beating the life out of each other. Combined with Guy Major’s stark colors it almost looks like an in-flight safety card from an alternate universe were bone crushing fisticuffs are the norm. So much happens between the panels that the pages are easy to race through This is a mistake. Though it does feel great to breeze through don’t allow yourself the easy high. Stop and appreciate the detail. The anguish on Bond’s face as he’s hit in the kidney. The blood lust joy that snarls his face as he smashes a man’s face into a wall. The cold calculation as he straightens his tie. And now you’re not even half way done with the issue. The power of great writing isn’t just pithy lines or catchy phrases. It’s in restraint and Ellis exercises more restraint in one issue that many writers do over their entire careers. So too does Masters. Bond’s kills are brutal and Masters doesn’t shy from them but his stark backgrounds and clean scenes draw the eye to gruesome details with aplomb. Bond’s post attack debrief raises more questions. Who is attacking? Why do so many people want to see the superficially mild mannered Ms.
mystery beautifully implodes on itself. M says the word emblazoned on the front issue. Eidolon. Ghost. Spectre. 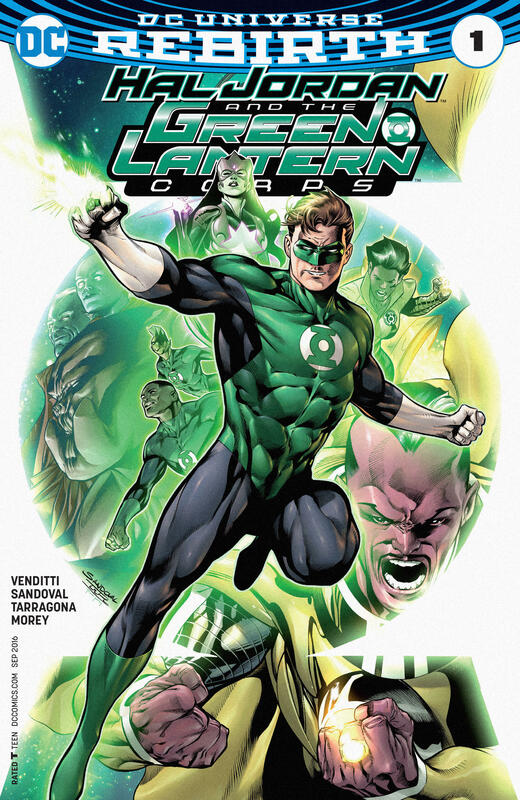 These past few weeks are the first time I’ve checked in on the Green Lantern books since the end of Blackest Night (though I do recall reading a story where Hal and Sinestro got stuck in the Land of the Dead, I didn’t really stick around). I dug Rebirth: Green Lanterns # 1 and I am excited to read Jessica Cruz’s adventures, but I’ve always had a soft spot for Hal Jordan. Yeah, he’s the “boring” Silver Age Green Lantern, but the cocksure test pilot’s bravado always intrigued me. Batman is my favorite, and Hal is Bruce’s opposite number. Batman is cunning and uses fear as a weapon whereas Hal is all about barreling through with no fear. It’s alien to him. Hal falls into a trap? Oh well, he has to find his way out of it. Hal Jordan and the Green Lantern Corps # 1 picks up where the Rebirth special left off. The Green Lantern Corps are missing and the Sinestro Corps have replaced them as the universe’s intergalactic police force. Hal Jordan, the last of the corps, is searching the cosmos for clues to his fellow space cops’ whereabouts. He’s all alone, but you wouldn’t know it from his attitude. He’s going to find his friends, no matter what. Meanwhile, Sinestro, not content with being the universe’s top cop, begins his return towards the role of a traditional villain. Geoff Johns left a huge mark on the Green Lantern mythos. The Sinestro Corps, Indigo Tribe and Larfleeze all make appearances in this issue but one of Johns’ largest contributions was the characterization of Thaal Sinestro. He went from being a fairly one or two note villain to a fully fleshed out tragic lead. Venditti plays on Sinestro’s desire for order in order to move him closer to straight up villain. Rafa Sandoval’s art here is some mighty fine Green Lantern art! Sandoval draws all manner of extra-terrestrials, space creatures and alien worlds. He also draws some fun constructs too! I’m looking forward to seeing him draw the rest of the gang in subsequent issues. For now though, I am more than happy to see his Hal take on some space thugs while Sinestro tightens his grip on the DC Universe spaceways.